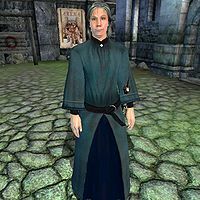 Mages Guild scholars are NPCs that are found in the Arcane University of the Imperial City. They serve no major purpose and their foremost job is lecturing the apprentices. Unlike the apprentices, who you can order to follow you as Arch-Mage, the scholars will treat you exactly like they did when you were an apprentice yourself. Stealing from or attacking a scholar will still get you kicked out of the Mages Guild. All Mage Scholars wear a standard mage's robe and a pair of russet felt shoes. In combat they rely on an iron dagger and a second, enchanted, dagger of the best possible quality for your level. In addition, all Mage Scholars will be able to cast 3 Destruction spells (2 weak, 1 powerful), 3 weak Conjuration spells (2 Bound Armor and 1 Summon), 1 powerful Restoration spell and 1 powerful Illusion spell. All Mage Scholars have very similar and rather monotonous schedules: they will spend most of their day wandering around the University Campus, at times conversing with one another about recent discoveries. At 10am and 4pm, every Mage Scholar has a random chance of lecturing the apprentices for two hours about doomstones and runestones at the podium outside the Praxographical Center. While they will all sleep in the basement of the Mages' Quarters, half of them will go to bed at midnight and sleep until 6am, while the other three from 6pm until midnight. The Mage Scholars always seem to be too concentrated on their studies to pay you any notice, even if you are Arch-Mage. When you speak to them they will casually dismiss you by saying: "Hmm? Yes, yes, I'm sure you've got something exceedingly important to say. But the Apprentices do not teach themselves, now do they? Good day." or more eloquently by asking you: "Why do the guards insist on letting you rabble inside University grounds? Take your pedestrian gawkery to the Arena! Begone!" Oddly enough, there is one Altmer Mage Scholar in the University that will talk to you, provided his disposition is above 30. He has no unique dialogue, however. There are six different Mage Scholars present on the Arcane University campus: two male Altmer, two male Dunmer and two female Nords. All of the Scholars of the same race will have identical stats. This page was last modified on 27 February 2013, at 18:55.